Samsung Telecommunications America (Samsung) and Verizon Wireless today launched the SCH-a950, the perfect music phone for turning customers into mobile DJs. A phone for all the senses, customers with an a950 will also experience enhanced sound quality – from ring tones to music/video playback to conversations via speakerphone – through the phone’s dual stereo speakers. 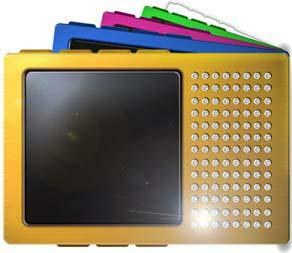 Equipped with an MP3 player, consumers can take their favorite tunes with them wherever they go. The number of songs is limited only by the size of the TransFlash™ memory card (purchased separately) that fits neatly in the a950’s expandable memory slot. Pressing the play key on the front of the phone activates the music player. Navigating through the phone’s music library is also a breeze. Music lovers can use the a950’s sleek jog dial to scroll through their playlists, while the keys on the phone’s exterior allow customers to stop, start and skip around to find the tune to fit their mood. Adding another level to its multimedia multi-tasking, the a950 uses advanced wireless technology and design to offer a complete entertainment experience. Whether streaming news and sports video highlights on Verizon Wireless’ V CAST service, downloading and watching crystal clear V CAST video clips from the hottest new music videos and celebrity gossip news, or listening to favorite songs through the phone’s MP3 player and stereo speakers, customers will have easy access to the very best in wireless entertainment. Additionally, the phone brings imaging to the multimedia mix with its 1.3 megapixel digital camera and camcorder, allowing snap happy customers to capture still images or video clips to send and share with family and friends. The a950 is available for $149.99 after $100 mail-in rebate with a two-year customer agreement and in the 1,900 Verizon Wireless stores across the country and at Circuit City locations. For more information on Verizon Wireless products and services, visit a Verizon Wireless Communications Store, call 1-800-2 JOIN IN or got to www.verizonwireless.com. Witness the evolution of the revolution. First it played songs. Then photos. Then podcasts. Now iPod plays video, changing the way you experience your music and more. Again. In lighter, thinner 30GB and 60GB models starting at $299, the new iPod is music to your eyes. Time for the world’s best music player to take the stage for another encore. In 30GB and 60GB(1) models that hold up to 15,000(2) songs, full-color album art and up to 25,000 photos(3), the new iPod makes the most of your music and more. Yeah, you’ve heard that tune before. Only now, you can watch it, too. With support for up to 150 hours(4) of video and a 2.5-inch color display, the new iPod lets you take music videos and TV shows on the road. The new iPod boasts up to 20 hours of battery life(5), five hours more than before. Plus, you get a bigger display and one more iPod color — sleek black. But here’s the kicker: At under half an inch thin, the new 30GB iPod takes up about 45 percent less room than the original iPod. Even the new 60GB model is 10 percent thinner than the fourth-generation 20GB iPod. More features in less space? Sounds like iPod. Now you can put all your music in your pocket and still have room for, well, practically everything else. Catch up on your reading with audiobooks. Browse your memories with photo slideshows, complete with music. Watch video podcasts, music videos and your favorite TV shows. Consult your calendar or look up an email address. Even check the time in another city or time your fastest lap. The new iPod keeps it all close at hand. The Apple Click Wheel gives you access to your entire music, photo and video library — from one thumb. Control volume and browse using the touch-sensitive surface. Play. Pause. Rewind and fast-forward. Rate your favorites. Create playlists on the go. Launch photo slideshows. The Click Wheel puts everything at your fingertips, so you can keep your eyes and ears on the music. Playing your iPod is only half the fun. Try filling it with downloads from the iTunes Music Store. Choose from over 2 million songs, 20,000 podcasts, 2,000 music videos or your favorite ABC and Disney television shows, download them to your Mac or PC and sync them to your iPod. Add an optional audio cable to play music from the iPod to your home stereo or use an optional S-video cable with iPod to play VJ on your TV. You can perform the same big-screen feat with iPod photo slideshows. Oh, and you can do it all from across the room using the optional Universal Dock and handy new Apple remote. iTunes 6, the next generation of the world’s most popular music jukebox and online music store, lets fans purchase and download over 2,000 music videos and six short films from Academy Award-winning Pixar Animation Studios for just $1.99 each. Customers can also now purchase and download their favorite television shows from iTunes the day after they air on TV, watch them on their Mac or PC and Auto-Sync them onto the new iPod for viewing anywhere. You’ve got the best seat in the house. The full-screen Front Row media experience — with its intuitive menus, large text and brilliant graphics — lets you browse the music, photos and videos on your iMac as easily as you browse music on your iPod. And the new Apple Remote lets you do your browsing from anywhere in the room. So gather your friends and dazzle them with a slideshow of your vacation pics, a home movie or a DVD. iMac G5 was born to entertain. With iTunes, you’re never more than a click away from the world’s most popular source of music, audiobooks and podcasts. Now the digital revolution strikes again — you can also purchase your favorite music videos and selected TV shows. Download those episodes of Lost or Desperate Housewives that you missed. Or sync your videos with the new iPod and watch them anywhere. There’s an iSight camera built into every new iMac, so you can start a video chat (or join one) at a moment’s notice. There’s nothing to buy, nothing to attach, no cords to fumble with, no software to install or configure. Simply start up iChat AV, click your buddy’s video icon and you’re ready to chat with sight and sound — with up to three friends at once. Proper attire suggested. The new Photo Booth application (included) turns your iMac into a modern-day arcade photo booth (minus the coin slot). Just pick a special effect like sepia tint, x-ray, bulge or squeeze. And smile. Presto — instant high-quality photo. Once you have the perfect pic, take advantage of Photo Booth’s connections to share it via Mail, save it in iPhoto or use it as your Address Book or iChat buddy picture. Behind its breathtaking 17- or 20-inch widescreen display, iMac G5 displays some monstrous power — with a 1.9GHz or 2.1GHz G5 processor, a sizzling new PCI-Express ATI Radeon X600 Pro or XT graphics processor with 128MB of dedicated video memory and a new high-bandwidth system architecture. These technologies, coupled with Mac OS X Tiger (the world’s most advanced operating system), simply make iMac G5 a joy to drive. Whether you’re exercising your creativity, surfing the web, playing compute-intensive games or just staying in touch with friends. iMac G5 has the power — and the brains — to be the center of your digital universe. 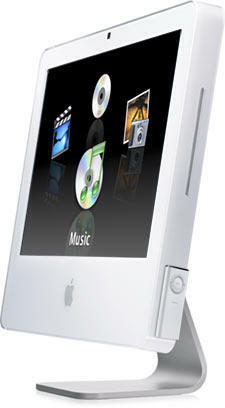 It comes with iLife ’05: a suite of easy-to-use applications that make the spectacular part of your everyday life. Enhance, organize and share your photos via iPhoto. Make an epic starring your kid in iMovie. Turn your photo and movie creations into professional DVDs with iDVD. Create original music in GarageBand, even if you can’t carry a tune. Like any modern computer should, iMac G5 comes ready with software preinstalled to use your digital devices right away. Just plug them in. With a plentiful passel of ports — USB 2.0, FireWire 400, composite and S-video outputs, audio in and out — you can connect just about any device, from cameras and camcorders to hard drives, stereos and the Mighty Mouse included with every iMac G5. With the forward-thinking Scroll Wheel, you can move around your digital life with 360° of freedom. And with built-in Gigabit Ethernet, you’re all set for wired networking. Nokia E60, Nokia E61 and Nokia E70 combine the power of 3G and WLAN with advanced voice services and mobile email applications in a variety of designs for every employee. Nokia announced today the addition of three new models to its portfolio of business-optimized devices. The Nokia E60, Nokia E61 and Nokia E70 - the first of the new Nokia Eseries - are distinctively different in design and allow businesses of all sizes to mobilize their workforce. Nokia Eseries models combine attractive and easy-to-use designs that appeal to individual business users with new underlying technologies that allow IT departments to effectively manage security settings, corporate applications and data. Each of the devices is designed to accommodate must-have mobile applications needed in today's business world like mobile email and advanced voice calling functions. 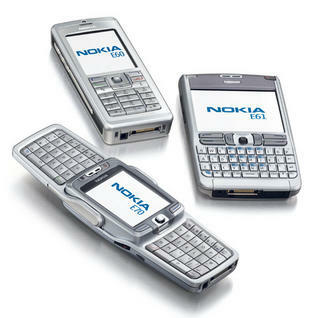 The Nokia E60, Nokia E61 and the Nokia E70 will be available in the first quarter of 2006 worldwide. The Nokia E60 provides the uncompromised look, comfort and usability of a classically designed mobile phone. Supporting an array of advanced call features from integrated speakerphone and conference calling to voice-aided applications like Push to talk, and IP-based telephony, the Nokia E60 is the best mobile device for active voice communications - in and out of the office. The Nokia E60 offers fast and flexible data connections with WCDMA enabling wide area connections and WLAN offers a cost effective option for local access. Although optimized for one-handed use, its large color screen makes email and calendar entries easy. 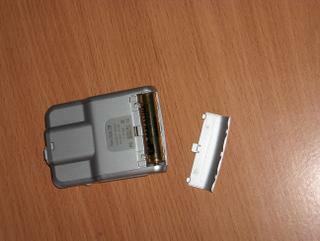 The Nokia E60 operates in GSM900/1800/1900 and WCDMA2100 networks. 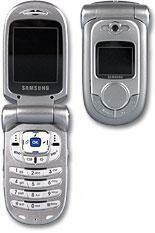 The Nokia E61 is designed in the familiar style of today's most popular mobile email devices. Yet it is incredibly slim and packed with powerful new functionality. A cinch to use with either hand, the device has a four-way joystick and full keyboard combined with a wide 16 million color screen making mobile email easier than ever before. Supporting multiple mobile email clients like BlackBerry Connect, GoodLink, Nokia Business Center, Seven Mobile Mail, Seven Always-On Mail, and Visto Mobile, the Nokia E61 provides seamless and encrypted mobile connectivity. Full attachment handling (documents, spreadsheets, presentations, PDF viewer and ZIP manager) and an editing function (document, spreadsheet and presentation) are included. The Nokia E61 also includes the same advanced business call features and IP-based telephony functions as the Nokia E60 and Nokia E70. The Nokia E61 can send and receive emails, even when on a phone call. 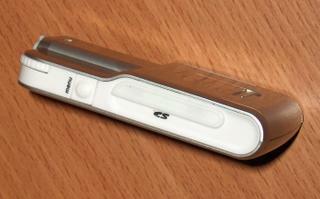 The Nokia E61 operates in GSM850/900/1800/1900 and WCDMA2100 networks. At first glance, the Nokia E70 looks like a modern smartphone. Open it up and find a full messaging keyboard for fast and easy thumb typing, a generous color screen for viewing emails, plus attachments (document, spreadsheet, presentation, PDF viewer and ZIP manager) and an editing function (document, spreadsheet, presentation) for staying up-to-date with the inbox. Like the Nokia E60 and Nokia E61, the Nokia E70 supports a common set of applications like advanced voice and email. Nokia will offer two versions of the Nokia E70 - one optimized for mobile networks in Europe and Asia (GSM900/1800/1900/WCDMA 2100) and one optimized for mobile networks in the Americas (GSM850/1800/1900), yet both versions are able to roam in GSM networks across regions. Nokia also offers a comprehensive service portfolio for its business devices and solutions ranging from technical support to implementation, professional services and technical training. Nokia's services are available to better serve customers and enable successful end-to-end mobility solutions. 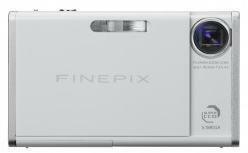 Fuji has launched the compact FinePix Z2 Zoom 5.1 megapixel digital camera. T-Mobile has launched its first branded Bluetooth headset – the SH305, manufactured by SouthWing at a great value cost of £29.99. The device is one of the smallest and lightest headsets available on the market today weighing only 11 grams. SouthWing is the first manufacturer to receive the TMTI hologram status from independent testing and support company TMTI (Talk Me Through It) and the T-Mobile SH305 is the best for compatibility, comfort and style according to their independent tests. TMTI also provides testing and support for customers on pairing and using their Bluetooth products and also support on how to use the ever-growing number of advanced handsets in the market today. The SH305 is the first headset to have an innovative favourite number button; Push4™, allowing customers to dial their most frequently used number or voice service just by pressing this button, with no need to touch the handset. 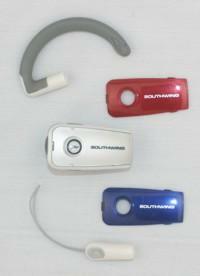 SouthWing is the first company to introduce and patent this new technological advance in hands-free headsets. T-Mobile is selling the device for £29.99 inc Vat, making it one of the most competitive Bluetooth headsets in UK. 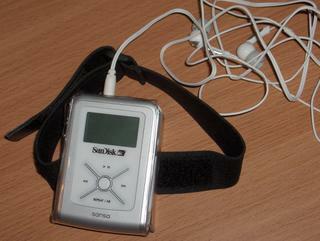 Its impressive features include: six hours talk time; battery level indicator; 12 ring tones; various wearing options including with or without a hook; clipping to clothes or securing to your phone by means of the included lanyard and two additional covers to customise the headset’s look. CNET.com has posted a preview of the creative Zen Sleek photo, which will have 20 GB. 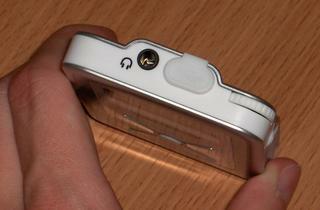 It also features a bright and vibrant OLED display. Two chief complaints about the Zen Touch were its bulky build and its lack of an FM tuner. 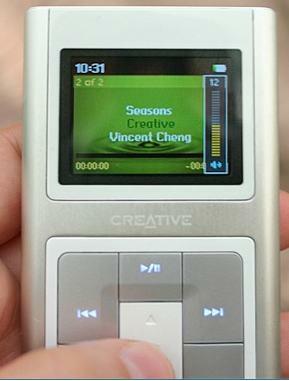 Creative listened by adding an FM tuner, as well as a voice recorder, and making the Zen Sleek Photo, well, sleek. At 4 by 2.2 by 0.6 inches and 5.4 ounces, it's significantly slimmer and lighter than the Zen Touch--and lighter and narrower than a 20GB iPod. Its striking design is a quarter iPod Mini, a quarter Zen Micro, and a half Dell DJ-20. start shipping during Q1 of 2006.
times that of more traditional voice-centric mobiles. have time to create and certify as many applications as possible. enabling full e-mail access with attachments, anywhere, anytime. keyboard positioned beneath the flip-down keypad on the main body of the phone. trial version of a virus scan package. access to corporate network services. and updated PC sync software with extended synchronization possibilities. Technology outlined their plans to support UIQ 3 developers. 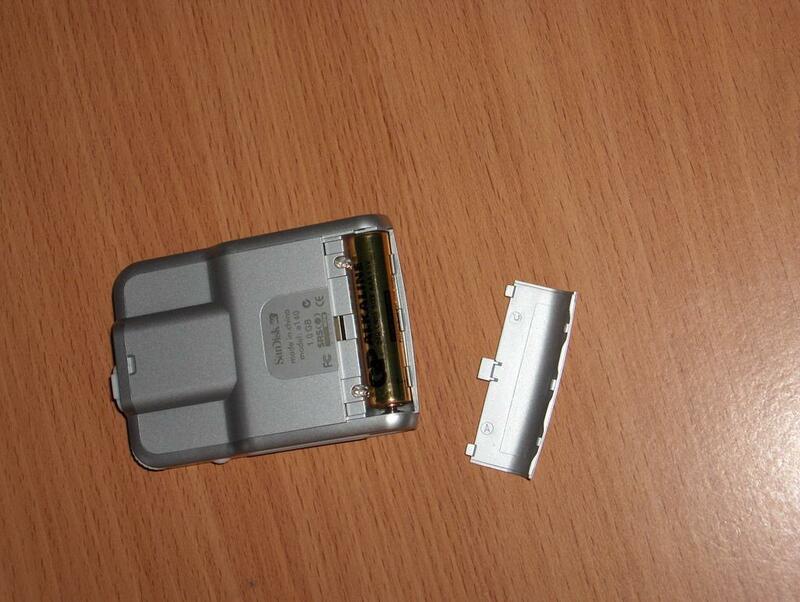 P990c Dual mode UMTS (2100MHz) - GPRS 900/1800/1900 for Mainland China. Launch for mainland China dependant on availability of 3G services. Application Planning, gives a keynote presentation. Nowadays the most expensive mp3-player all over the world is made by Douglas J. Music Group and costs $ 45.000. Who find the casual plastic boxes are to simply, can find in this company the 'Presidential' mp3-player. The cases are available in white or yellow gold and the diamonds can be placed in different patrons. Delivering by courier on every place on earth is included in the price. The technical specifications gives the manufacturer only free after paying fifty English pounds, but considering the limitations of technique there will be not so much better than those of other high-end mp3-player. Today we’ll take a look at the SanDisk Sansa e140 with 1 GB of Flashmemory, this can be boosted to 2 GB with SD memory cards. On the next photo, you see how the mp3-player will be delivered. 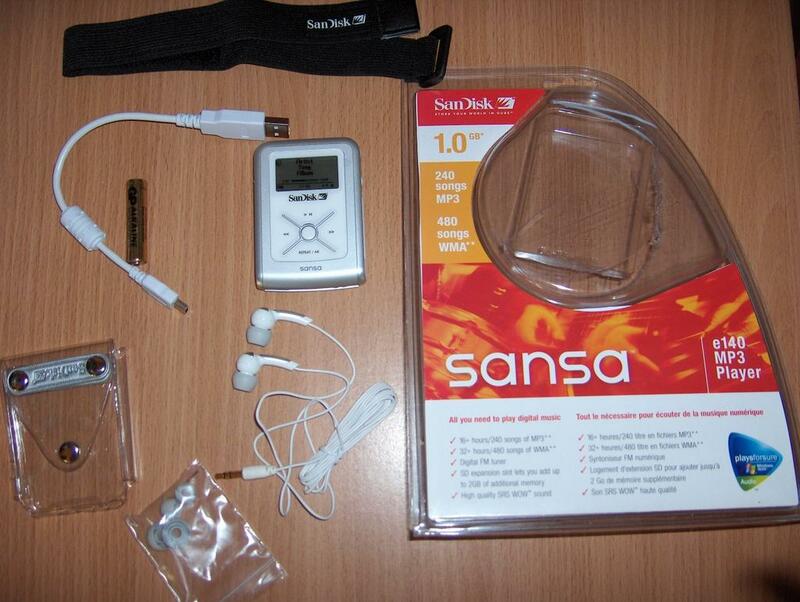 Sansa e140 mp3-player, carrying case with armband, stereo in-ear headphones, AAA alkaline battery, USB 2.0 travel cable, quick start guide, CD with valuable software and user manual. For the Sansa e140 you don’t need to install special software. You plug in with the USB cable and you can drag ’n drop your music on it. Standard you can store 1 GB of music (about 240 mp3’s). Slide in the battery, plug in the stereo headphones and you are ready to listen. This in-ear headphones feel a bit strange in the beginning, you have to get used tot hem, because of their format. They filter out the background noise, because they deliver the sound directly in your ear canal. You can, if you prefer, use other ear phones off course. The sound quality is good. Above you see the name of the artist, the songtitle and the name of the album. It also displays a counter and completely at the bottom you see the total number of songs on your player and the current position. When used, the player lights up blue, which is cool to see! When clicking right on ‘menu’ you come into the menu, they are easy to use. You can scroll through the menu with the rotary wheel, which you can find in the right corner of the Sansa. In the menu, the mp3’s are sorted by title, artist, album, genre and year. Further you can also change your settings like language, date and time,…It’s a pity that Sansa e140 makes no use of a playlist. In the information menu you can find out how much available memory you still have, how many is used and how many songs there are on your player. 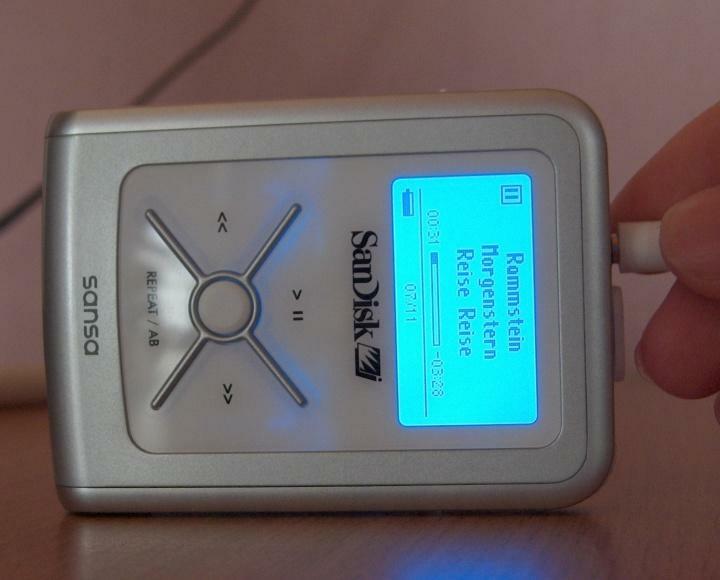 When you go to ‘Modes’, you find the FM radio tuner, an other feature of the Sansa e140. The FM radio is from an excellent quality. You turn the wheel and you see the FM tuner moving on the display. Once you have chosen a radio frequency, you can store it, you can store up to 20 preset stations. When you want to change the volume, you turn again on the wheel. This is also the same when playing mp3’s. Personally I find the rotary wheel not so handy, it’s rather stiff. 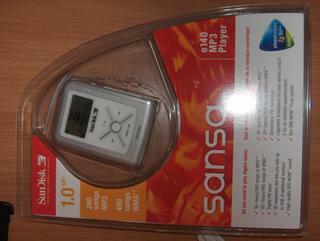 Another feature of the Sansa is the stopwatch, which works just by using the play/pause and repeat button. On top of the player is the audio-output next to the USB port. The opening under the menu-button is used to put in an extra SD memory card, you can add up to 2 GB on your player. With 1 AAA battery you can, according to SanDisk, listen up to 17 hours. The player lays good in the hand and weights not so much. With the Sansa e140 you get delivered: extra eardops (3 formats), carrying case with armband, USB 2.0 travel cable, stereo earphones and a CD-ROM with a few software programs. When you do the Sansa around your arm, with the delivered armband and the carrying case, you can for example use the lock button to lock the controls. 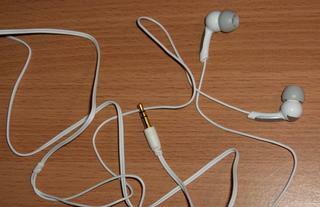 So you can also listen to your favourite songs or radio during sport, work or cleaning. On the included CD-ROM you find SanDisk’s user Manual, with description and features about the Sansa e100 Series. With Rhapsody (Real’s online music service) you can easily import CD’s and burn them or transfer them to your Sansa. Audible.com and Audiofeast are programs to listen to the radio. Audiofeast gives a 60 day free trial. The SanDisk Sansa e140 is easy to use, but you have to get used to the rotary Wheel, which is not so handy because it’s rather stiff. The quality of the FM radio is very good, just like the quality of the sound, but personally I don’t prefer in-ear headphones. The player can be found for as low as $ 100 in retail stores. Vandaag een nieuwe review: de SanDisk Sansa e140 met 1 GB Flash opslagruimte, aanvulbaar tot 2 GB met SD memory cards. 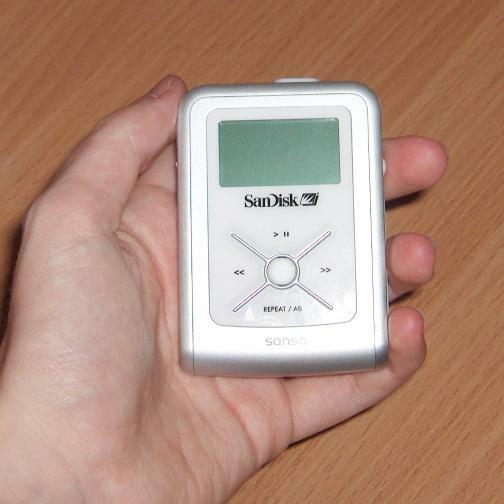 Op de volgende foto zie je hoe deze mp3-speler bij jou thuis geleverd wordt. 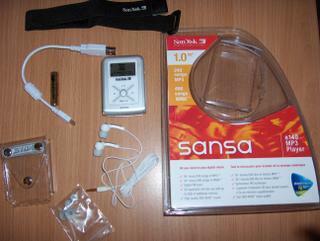 Sansa e140 MP3 speler, draagtasje met armband, stereo oortelefoontjes, AAA alkaline batterij, USB 2.0 travel kabel, snelle starters gids, CD met beschikbare software en een handleiding. Voor de Sansa e140 hoef je geen speciale software te installeren. Je plugt gewoon in met de USB kabel en je zet er je muziek op. Standaard kan je er 1GB aan muziek op kwijt (zo’n 240 mp3’s). Nog even een AAA-battery erin, Stereo Earphones aansluiten en je bent klaar om te luisteren. Deze in-ear oortelefoons moet je toch gewoon zijn, vanwege hun formaat. De koptelefoontjes filteren het achtergrond geluid, doordat ze het geluid direct in je gehoorskanaal brengt. Je kan natuurlijk wel zelf andere oortjes inpluggen. De geluidskwaliteit is wel goed. Bovenaan zie je de artiest, de songnaam en de titel van het album. Daaronder zie je een balkje met het tijdsverloop en helemaal onderaan zie je nog naar het hoeveelste liedje van het totaal aantal songs. Dit alles op een blauwoplichtend LCD-scherm bij gebruik van de toetsen. Door aan de rechterzijde op ‘menu’ te duwen kom in je in het menu waardoor je kan scrollen met de ‘Rotary Wheel’ rechtsboven op de hoek van de speler. In het menu worden de mp3’s opgeslagen per artiest, album, jaar en genre. Verder kan je daar ook nog de instellingen wijzigen, de taal, datum & tijd, …Jammer dat de Sansa geen gebruik maakt van een playlist. Bij informtie kan je terugvinden hoeveel beschikbare ruimte je nog over hebt, hoeveel je al gebruikt hebt en hoeveel songs er op je speler staan. Je kan naar ‘Modi’ gaan waar je de FM Radio vindt. De FM Radio is van een uitstekende kwaliteit, je draait aan het wiel en je ziet de FM tuner zich verplaatsen op het scherm. Eenmaal je een radio frequentie gekozen hebt kan je die opslaan. Er kunnen zo 20 frequenties ingesteld worden. Als je graag het geluid zou willen aanpassen dan draai je opnieuw aan het rotary Wheel. Dit is ook zo bij het afspelen van MP3’s. Persoonlijk vind ik dit rotatie wiel niet zo handig/soepel draaien. Het is nogal stroef. Verder heeft de speler ook nog een stopwatch, die werkt gewoon door het gebruik van de ‘play/pauze’ toets. Bij het afspelen van gewone mp3’s gebruik je de knopjes aan de voorzijde van de speler. Ze spreken wel voor zich: vorige, volgende, play/pauze en repeat. Bovenaan naast de oortelefoon-ingang vind je ook de USB-ingang. De opening bij de menu toets dient om een extra SD geheugen kaartje in te brengen. Zo kan je tot 2 GB aan muziek op je speler zetten. 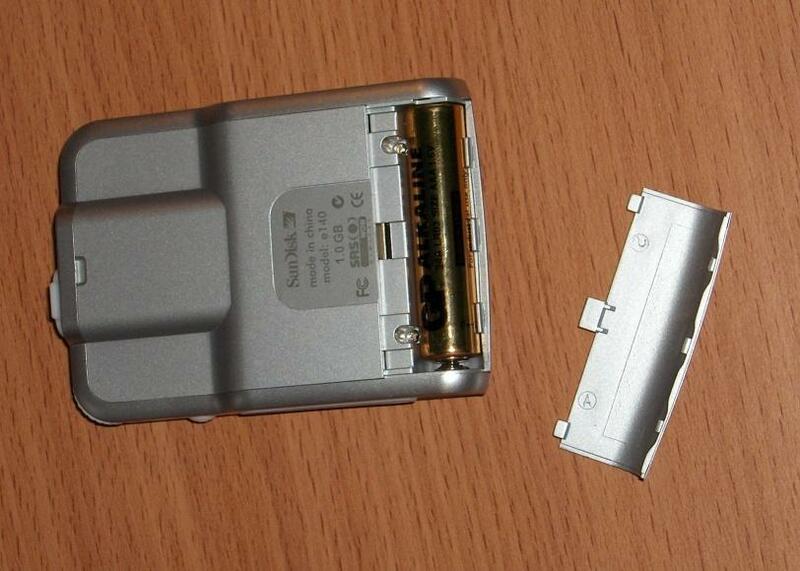 Met 1 AAA-batterij kan de speler, volgens SanDisk tot 17 uur spelen. Hij ligt ook goed in de hand en weegt niet zo veel. Bij de Sanse e140 krijg je dit nog meegeleverd: extra oordopjes (in 3 formaten), het draagtasje + armband, USB kabel, de earphones zelf en de CD-ROM met enkele software programma’s. Op de bijgeleverde CD-ROM vind je een SanDisk user Manual, met beschrijving en details over de Sansa e100 Series. Met Rhapsody (Real’s online muziek winkel) kan je gemakkelijk CD’s importeren en branden of overbrengen naar je Sansa. Audible.com en Audiofeast zijn programma's om te luisteren naar de radio. Audiofeast geeft een 60 dagen gratis proefperiode. De SanDisk e140 is eenvoudig in gebruik, wel een beetje ‘leren’ werken met het rotary Wheel, wat toch niet zo handig is door zijn ‘schokeffect’. De kwaliteit van FM Radio is heel goed. De geluidskwaliteit van de oortelefoon is goed, maar persoonlijk prefereer ik geen in-ear oortelefoon.